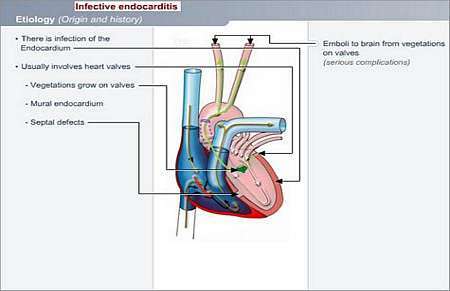 Infective endocarditis occurs when there is infection of the inner layer of heart muscle (endocardium); with heart muscle, the myocardium has the largest bulk. Infection of the endocardium usually involves the heart valves, where vegetative growths develop. Small pieces of these vegetations may break free and embolise to the brain causing a stroke. Complete blood count (increased white blood cells and reduction in red blood cells and haemoglobin; anaemia). ESR (erythrocyte sedimentation rate) is increased. Examination of urine (shows blood in urine). Culture and sensitivity of blood may show evidence of the infective organism responsible for causing the endocarditis. Intravenous antibiotics to start with; this may have to be continued for an extended period if necessary. It may be necessary to surgically replace damaged heart valves.